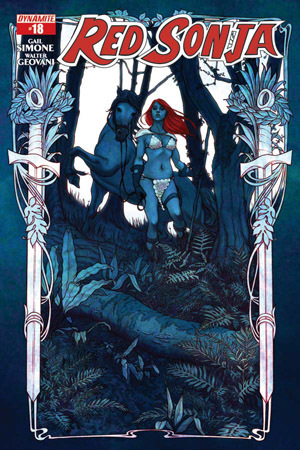 Last week the final issue of Gail Simone’s Red Sonja was released. With all of the delays in the release schedule it was a longtime coming. Admittedly I was slow on getting around to reading it but it was worth the wait. With the final arc Sonja has to make the decision to stay and defend the sisters and their library from the queen’s men. What makes the decision harder is the word that the queen is sending her toughest killers the Vipers, a group of three men that have exceptional skills and no mercy. A fact that should make Sonja forget about trying to protect the sisters, especially since she doesn’t care about books at all. But would it be Red Sonja if she didn’t fight a “losing” battle. This issue was the perfect wrap up for the the story that Simone has been telling for the last couple of years. It brings all of the narratives that Simone has been working with over the last eighteen issues to a perfect close, and even manages to bring the story full circle.